This beautiful jar of sangria seems as fitting a symbol as any for how these days after the move have unfolded--abundance, color, sweetness, and lots of sharing with friends and family. Maybe I mentioned here that I was scared of being lonely. I am sure those moments will come--the kids in school, Yancey on shift, me missing all my Seattle connections. For now, though, this jar is full. Kelly joined us for dinner, and she helped us empty it. I've known Kelly (Yancey's sister) since she was twelve (!!! ), but it's been a really long time since we lived in the same town. It's great to be together. If your sister-in-law is visiting (or friend, boss, neighbor, mother...), pour them a ladle-full of this. 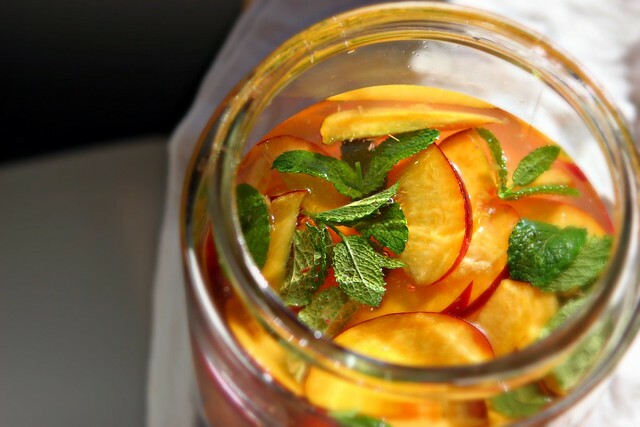 The fruit doesn't need to macerate like this sangria, and it can be whipped up in a flash. Happy Summer, friends. Empty a bottle of fruity sauvignon blanc into a pitcher or jar. Add 1 large, thinly sliced peach, a cup of pitted, halved cherries, and a thinly sliced apricot. Add 1/2 c. Triple Sec, 1 can. San Pellegrino limonata soda, juice of one lemon, handful fresh mint leaves, and a few Tb. of simple syrup. Taste, adding more lemon or simple syrup to taste. Refrigerate until ready to use, then pour over ice.